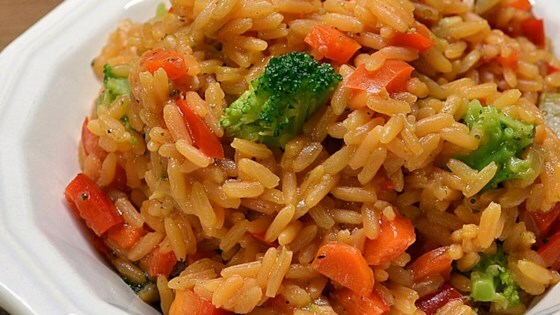 "Spanish yellow rice with fresh veggies that everyone loves." Heat oil in a saucepan over medium heat. Cook and stir onion, carrot, broccoli, red bell pepper, and garlic in hot oil until garlic just begins to brown, about 5 minutes. Pour vegetable broth into the saucepan; add rice, sazon seasoning, and adobo seasoning and stir. Bring the liquid to a boil, reduce heat to low, and cook until the liquid is absorbed and the rice is tender, about 25 minutes. Fluff rice with a fork to serve. I followed recipe but came out sticky taste is good. Wonder what I did wrong? A very tasty dish! I left the Goya spices out and replaced them with standard seasoning. Perfect for dinner and lunch. Great tasting dish and easy to make. Personally, I would add a can of corn for sweetness and texture. All in all...DELISH! good. nice for a different rice dish. can use any veggie! Made for dinner tonight. It was absolutely delicious only thing I did different was omit the red bell pepper and used 2 packs of goya. Couldnt stop eating it...will be a regular in my house. Very good recipe, adding to regular rotation. I made with beef broth as that was what was on hand.